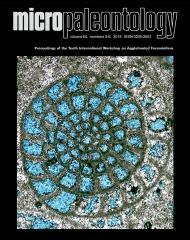 ABSTRACT: Five hydrocarbon seep carbonate structures in the upper part of the Slottsmoya Member (Agardhfjellet Formation) in central Spitsbergen have been sampled and processed for foraminifera. The carbonates have been found to contain excellently preserved agglutinated assemblages, in contrast to the diagenetically deformed assemblages in the adjacent shales. In total 15 genera and 35 agglutinated species are recognised in the palaeoseeps. The pristine condition of the foraminiferal tests allows for detailed morphological documentation of 21 species, of which the following six are proposed as new: Reophax pyriloculus n. sp., Haplophragmoides perlobatus n. sp., Labrospira lenticulata n. sp., Ammobaculites deflectus n. sp., Ammobaculites knorringensis n. sp. and Textularia pernana n. sp.. Depositional environment of the carbonate palaeoseeps is interpreted to be similar to that of a normalmarine shelf, as opposed to the previously documented restricted (hypoxic) environment of the adjacent shales. Morphogroup analysis of assemblages in the palaeoseeps reveals that over 89% of genera in the seep carbonate bodies are categorised as surficial/shallow infaunal to deep infaunal. The same morphogroup component in the shale succession onlymakes up 31.5% of the total genera. Agradual shift can be seen in the shale assemblages from almost exclusively epifaunal morphogroups in the lower part to a dominating surficial to infaunal component in the samples closest to the palaeoseep stratigraphic levels, which translates to an upwards decreasing oxygen level trend. The foraminifera date the palaeoseeps as late Volgian - late Ryazanian, and the ages for each seep structure are constrained by previously reported associated ammonite occurrences. Some species of foraminifera occurring in the palaeoseeps are possible candidates for extended stratigraphic ranges.